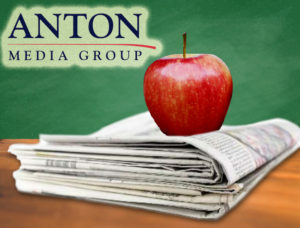 As a service to the community, Anton Media Group provides newspapers free of charge to teachers around Long Island for use in the classroom. 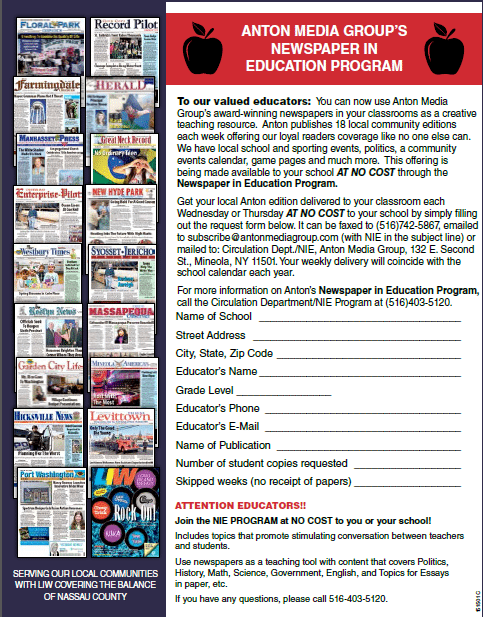 Our Newspaper In Education (NIE) initiative connects local students to their communities while strengthening their education. Several studies show that children who regularly read a newspaper demonstrate significant gains in reading skills. Used as an instructional tool in any grade level, newspapers reinforce lessons in language arts, social studies, math and science. The range of activities that can be completed with only one copy of a weekly newspaper is almost limitless. For example, teachers of younger grades can initiate a scavenger hunt for words and images found within the pages. Middle-schoolers can use the paper as a source in an essay about a town historical event. High school students can browse the classified ads and conduct mock interviews with one another—practicing a necessary life skill. In addition, learning about current events will spark interesting topics of conversation between teachers and students. Not to mention the important lesson kids will learn about recycling when it comes time to dispose of the papers. At a time when resources are few and far between, Anton Media Group’s weekly newspapers can be an invaluable asset to the classroom. Educators, sign up today by calling 516-403-5120.